It aims at reaching the best level, when compared to international mathematical journals, in all domains of applied and fundamental mathematics. It is hosted by Cedram.org, and is published under the Creative Commons license BY-ND. It is effectively diamond open access since it does not charge a fee to anybody (authors and readers alike). Access to the database containing the bibliographical references of all the articles is totally free via the “search” and “browse” functions. The database itself is the property of the Journal de l’École polytechnique, and contains elements covered by copyright. Any copy or reconstruction of a significant part of the database using data from the Journal de l’École polytechnique site is a counterfeit punished by law. Anyway, I’ve added that journal to my list of serious open access mathematics journals that don’t charge any fees. A week ago, Connes and Consani posted to the arXiv a 6 pages note titled The Arithmetic Site (and submitted to Elsevier owned CRAS). This note provides the algebraic geometric space underlying the non-commutative approach to RH. It gives a geometric framework reasonably suitable to transpose the conceptual understanding of the Weil proof in finite characteristic as in . This translation would require in particular an adequate version of the Riemann-Roch theorem in characteristic 1.
which sounds like there is still some distance before a proof of RH occurs (the reference  is this 1958 paper by Grothendieck, and wikipedia has some background for the notion of a site, and the Riemann-Roch theorem). I’ve now noticed that this paper had been preceded by some lectures by Connes and Consani at Ohio State University. Connes started working on a noncommutative geometry approach to RH in 1996 with a note in CRAS (freely available in Gallica) followed by this long 1998 paper. In recent years, with Consani and Marcolli, they have more and more evolved away from the physics interpretation side towards algebro-geometric notions such as the field with one element , and tropical geometry. If some readers with a good command of those topics wish to make informative comments on the latest note, they are very welcome to do so (comments are moderated but should appear within 24 hours). – in the april issue of Gazette des Mathématiciens, an interview of Arnaud Bodin and François Recher, who set up a 6 weeks course (on France Université Numérique) on elementary arithmetics & cryptography (intended level: first-year university students). There were 1400 subscribers, of which 300 actively participated, and 145 mastery certificates were given. Mean age was 30, and most participants had already a degree. — Sylvie Méléard, Jean-René Chazottes and Carl Graham, helped by three graduate students and a programmer, have run a 13 weeks course (on Coursera) on probability (intended level: third year university students). They mention 9600 subscribers, of which 5900 visited at least once, 750 followed everything, 624 posted on blogs/forums, and 250 got an attendance certificate (the course wasn’t offering a certificate of mastery). Quite a lot of american participants even though the course was in french, with a mean age about 30 too, and 60% with at least a masters degree. — Avner Bar-Hen and Jean-Louis Piednoir have run a 5 week course (on France Université Numérique) on fundamentals of statistics (intended level: about second or third year university students). Both are interviewed separately. 8000 subscribers, no mention of other figures but lots of hands-on remarks. — finally there’s an interview of Paul Farnet, a recent HEC graduate who cofounded themoocagency.com with recent Polytechnique graduate Aurélien Crocq, that’s a startup offering help to design and run a MOOC. 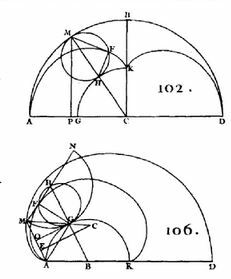 The first ever calculus textbook, according to wikipedia, appears to have been published in 1696 (that’s 318 years ago) by Guillaume de l’Hôpital (following lectures given to him by Leibnitz) under the name Analyse des Infiniment Petits pour l’Intelligence des Lignes Courbes. La différence de est . One would say la différentielle nowadays, but otherwise the notation was in nice final form.